The sallet or salade was a popular and elegant headpiece in use across much of Europe throughout the second half of the 15th century. Various forms developed during this time, they all fitted closely to the front and sides of the head but many, particularly those in the German style, flared away from the back of the neck and had extended tails, some very long and occasionally articulated, that swept back to a point. Most sallets covered the face to just below the nose and had a slit across the front through which the wearer could see. Some had fixed face protection, often referred to as a tipping sallet, whilst others had moveable visors. They were often worn together with a bevor because the sallet itself often gave no protection to the jaw and throat. 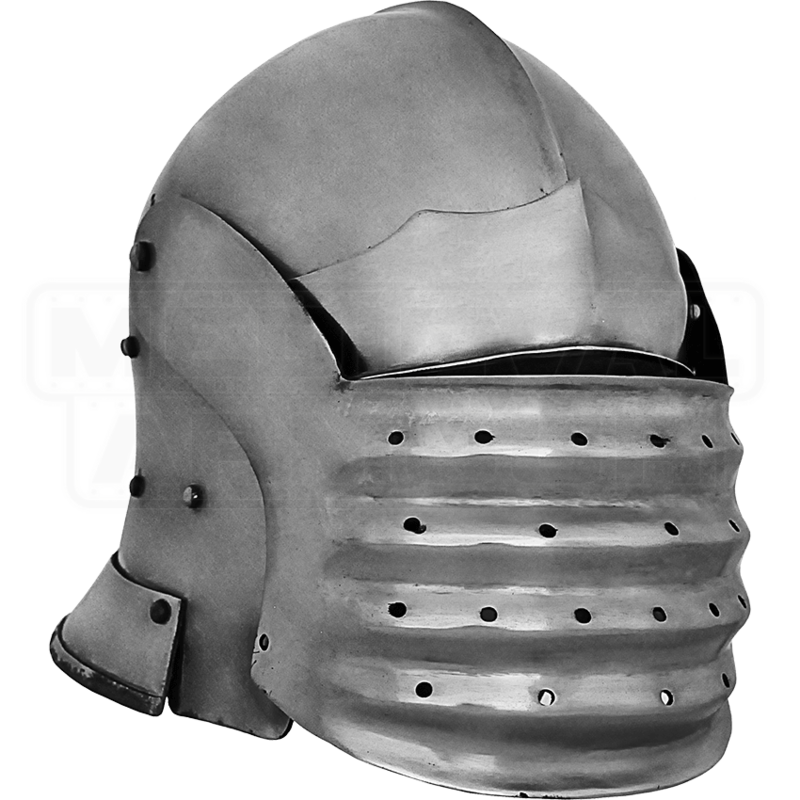 Sallets made in the Italian style, like our bellows face sallet, generally had shorter, more rounded tails that fitted more closely to the back of the neck. The extended bellows style visor on this example, so-called because of the pattern of ridges embossed into the visor, is a later development that did offer some protection to the wearers chin. This helm is based on transitional piece (between the sallet and the Maximilian style close-helm of the 16th century) that is dated to around 1490.